Totara Learning Management System (LMS) is tailored for the working professional and addresses the core requirements expected of a high-end corporate LMS. 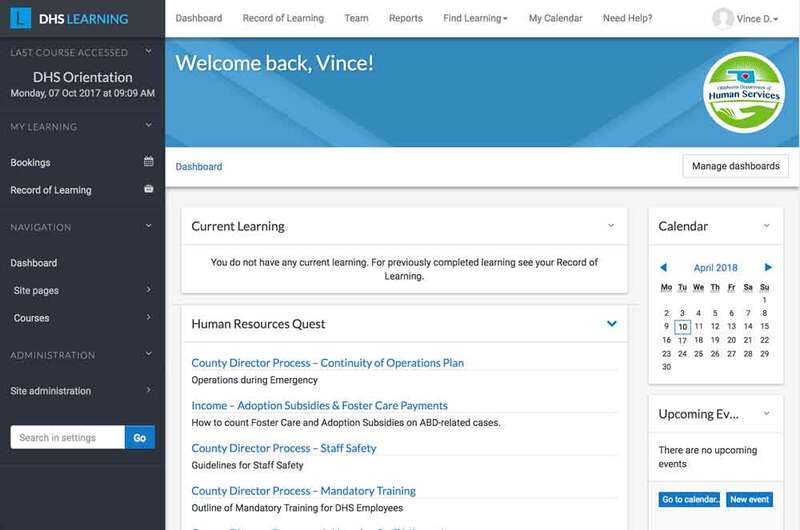 The Center for Public Management (CPM) utilizes Totara to deliver hundreds of synchronous and asynchronous courses and quizzes for several state agencies. As well as eLearning, you can manage a full range of offline activities such as classroom, group activities and assignments. A crucial element for organizations who have a varied workforce, Totara LMS canb e used on mobile devices. Evalute the progress of your learners with powerful built-in quiz engine, user polls or formal assignments submissions. Totara includes a variety of different reporting functions and options such as creating custom reports in the builder tool from scratch or modifying a set of pre-built reports. Totara Learn is uniquely designed to meet the online and offline learning management needs of busy organizations. But if you’re feeling a little lost, we have multiple ways of getting you back on track. When you have questions, our Totara LMS user’s guide is a great place to start. Topics range from authentication to Style Guides and documentation is presented in multiple ways to meet various learning style needs. The blog features announcements, tips, and best practices from the Totara team. In need of direct support of your unique question? Contact our Help Desk and a staff member will assist you with your questions.